Full Depth Reclamation (FDR) enables creating a stronger and wider road base and surface with minimal disruption of the project area while fully utilizing existing site materials. This eliminates the need to haul out and dispose of old materials as well as the cost to purchase and and disruption of hauling in replacement material. One of the main benefits of Full Depth Reclamation is that it Costs less than the traditional method of total reconstruction. 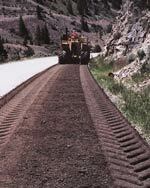 A big part of the cost savings comes from the re-use of the existing roadway material. This can be hot mix asphalt, chip and seal, cold mix or simply aggregate. Whatever the material it's already been purchased. In addition to this, less energy is used,which means additional cost savings. Often times the road or street remains open to traffic. Depending on the width of the road, one or two-way traffic can be maintained with adequate traffic control. In most instances, vehicles can run on the pulverized material following shaping and compaction.